We get a lot of questions on our Facebook page about ways to encourage children to use the potty. One of my personal favorite supports for potty training – and really, all things parenting – is to include children’s literature as a part of the approach. 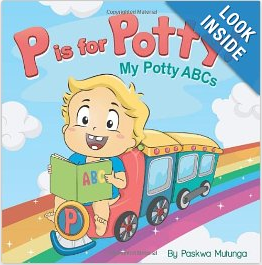 So, when Paskwa Murunga approached me about reviewing her book, “P is for Potty! My Potty ABCs”, I was more than happy to take a look. As you might have guessed, it is an ABC book, with each letter of the alphabet corresponding to something to do with the potty. A is for Ask, B is for Bathroom, C is for Clap, and so on. The illustrations are bright and engaging, and the look of excitement on the potty training toddler’s face just might be contagious – which is good news for parents trying to give a reluctant tike a little nudge into potty training. Likewise, the parents’ roll is portrayed in the illustrations as both supportive and celebratory, cheering on their little one through potty victory, and working through a few accidents as well. Give this book a try and get ready to read, recite the ABCs, and sing and dance your way to Potty Time success! We have a fantastic Facebook community where people can come and ask their potty training questions and get some support around the challenges sometimes faced during the training process. Here are a few recent topics that our readers want to know more about! I’ve given my spin on it. What’s your advice? First – congratulations! It sounds like you’ve already hit two big milestones! How would you feel about a little portable potty at his bedside for now? I wonder if when he wakes up he has to go really badly and isn’t quite alert enough to make it all the way to the potty. Or, how about leaving a surprise in the bathroom for him to find each morning? A simple toy, a healthy treat, a storybook… what do you think he would love to find? If he knows there will be a surprise waiting for him, he might be motivated to go check it out. Another option would be for you to be the keeper of the treat and right after he goes he has to run in and tell you. Honestly – ditch the pull-ups! They are great for some kids. And certainly they can be helpful in a pinch, or if you need to be out for an extended period of time running errands, traveling, etc. But, the absorbent pull-ups also feel a whole lot like diapers. To a child still learning to read body cues, there may be little physical motivation to get to the potty in time. When the inevitable wet accidents do happen, have your child take part in the clean up. It’s okay for them to handle the wet mess (you’ll need to handle solids for sanitary reasons). Have the child help wipe up and then go flush and wash just as if they had made it into the potty. Keep the routine consistent, even though the target wasn’t quite hit. We have a great free download for potty routine HERE. Oh dear, it sounds like he may be flexing his independence a bit! They talk about the terrible twos, but I personally found late threes (and fours) to be more challenging! So… how about a game? Are you dedicated to having him sit? If you let him stand just like a big guy, he may like that. In addition, letting him stand can set you up for a game that boys love. Play “Sink the Cheerios!” (or fruit loops, or whatever else is inexpensive and floats and flushes). Throw a few pieces of cereal in the toilet water and tell him to aim and sink them with pee. Another option is to squirt some blue food coloring into the water. When he pees into it (yellow), the water “magically” turns green. He can sit for that one if you’d like. Another thing you may want to try is taking him at specific intervals, but instead of it being your idea, which he seems to be resisting right now, use a timer or alarm. If you use your phone, let him choose a special ring tone he likes. Set the alarm for whatever interval seems appropriate for him (30 minutes, an hour, etc. ), and also set it for 10 minutes before you need to leave the house. 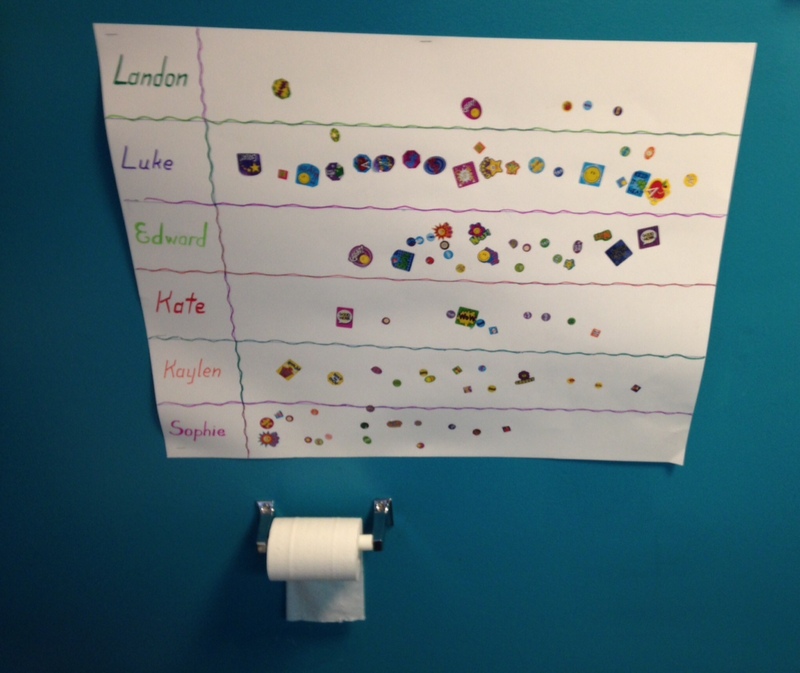 Make it a game: when the music goes off it is POTTY TIME – YAY!! And speaking of Potty Time – if you have a smart phone, you may find the features on our free app helpful. You can find the download for that HERE. Okay, first, deep breath there Mom and Dad! This too will come, in time. You should know that it is absolutely normal for a child to master one before the other. The muscles needed to control the bowels are a bit more complex than the bladder. Sometimes, it just takes a little time for the child to grow and mature. In the meantime, here are some tips to ensure you are setting up the child for success in the long run. Get set up: If you choose to use the big potty, there are two things you’ll want to make sure you do before expecting your child to start using it for pooping. The first is to get one of those insert seats that goes over the big one. That hole over the potty is very big for little bums! Secondly, make sure your child has a stool to rest little feet on. This is actually a physical necessity for many children. Feet firmly planted on a hard surface allows them to bear down on the muscles they need in order to release the bowels effectively. If little feet are dangling, these muscles are much harder to control! Prepare for the long haul: Sometimes a child needs to sit for quite some time before they are relaxed or ready enough to go. While sitting and waiting for the big event, sing songs, read stories, or check out our Potty Time App together! 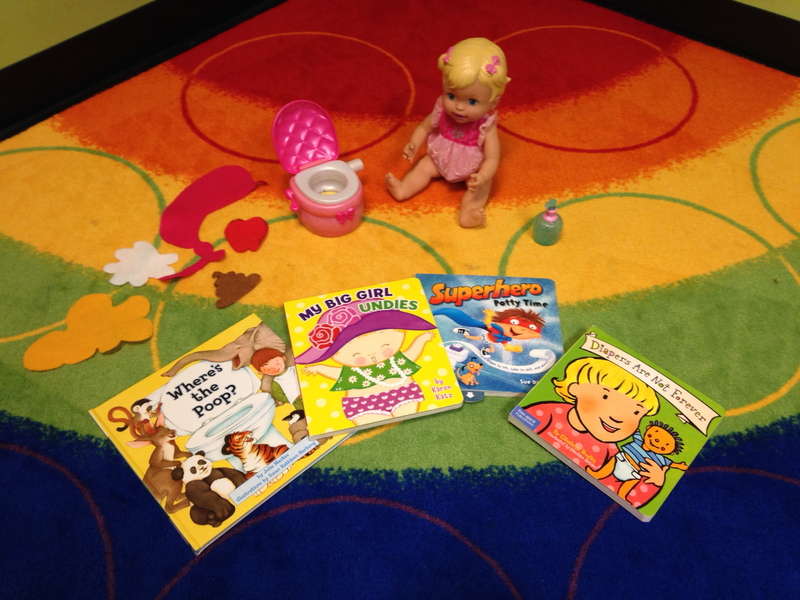 Or, check out our huge list of potty training book reviews and choose some to read together. Make it relaxing and even a little fun so your child is more inclined to stay as needed. Good luck! I promise this will come in time! Written especially for the potty training toddler who has a little trepidation about moving from the potty chair to the big potty, Teeny Totty Uses Mama’s Big Potty, by Yvonne Jones, is an adorable book that builds confidence and sets the stage for a successful transition. The illustrations are done in a style called ‘Chibi’, meaning “little” or “cute”, which is a form of the popular Japanese Manga cartoon style. The prose is set to a nice rhyme and rhythm that will draw children in. This “something” is of course transitioning to the big potty, and when Teeny Totty masters this, he will have Potty Powers! (A concept many young children are going to love!). The book goes on to talk about some common fears, such as the big seat and maybe falling in, and then addresses the fears with great strategies, such as the potty insert and a stool (we at Potty Time always recommend a stool for little feet!). After a successful potty venture, the child is taken through the steps of FLUSH and WASH, and of course lots of praise – a perfect time to CELEBRATE! (click on the link to hear a clip of the song). Parents may also appreciate the comprehensive list written just for them about transitioning from potty chair to potty. This list is found in the back of the book. 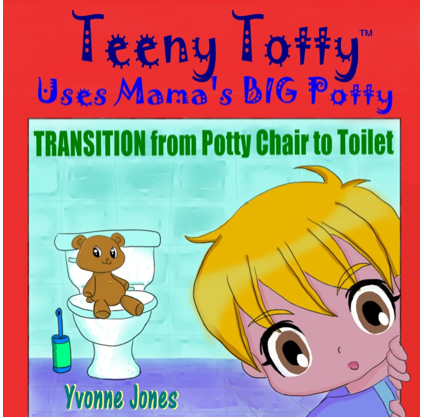 While this book, with its positive spin, would be just fine for any potty training method, it is especially nice to have one that addresses the sometimes dicey time going from potty chair to big potty. Is Potty Training Bootcamp Right for Your Child? There are endless ways to go about potty training. From diaperless babies, to waiting for signs of readiness, to pull-ups or underwear or commando… parents actually have a lot of decisions to make when embarking on potty training! One method that is popular with some parents is a “potty training boot camp” – in short, these programs (which you often purchase) promise that with a determined attitude, solid plan, hard work, and an intense few days, you can have a fully potty trained toddler, often in three days (or less!). But does this method work? And is it best for kids? The answer, much like the choices described above, completely depends on the kiddo and the family! Remembering that each child and family is different, and that Potty Time does not endorse a particular method, read on to learn some first hand stories from families who tried, succeeded, or moved on to something different. Heather is the mom of two-year-old twin boys, Callum and Cole. She learned about a boot camp method from a friend. With the cost of diapers being high, and concern that potty training could take what seemed like years for some people, she was ready to give it a try when the boys were 25 months old. Most of all, she looked forward to no more poopy diapers, and “one more thing off my plate”. It started out very positive. Supplies were ready, Mom and Dad were both home, and it was time to go! Callum got the boot camp method within an hour! For him, it was a complete success. Cole, on the other hand, took a different path (as children often do!). It was more frustrating with him, with frequent accidents and a period of time where he just didn’t seem to be getting it. At first, Heather felt really bad about it, like she might be pushing him too hard and he just wasn’t ready. However, on the sixth hour of the third day, something clicked! Cole too had mastered potty training, and Heather says she got a reminder of what faith in your kids’ ability can be. Heather recommends parents who want to try the potty training boot camp method stay strong and positive. She says you need to be 100% committed to the process, and has personally observed that people who try the method and stray too much had much less success. IT SORT OF WORKED, BUT…. Jenna is the mom of three-year-old Ryan. With preschool looming in the coming months, and a new baby brother in the house, it was time to seriously commence potty training. Jenna looked forward to jumping right in, rather than taking a slower months-long method and Ryan was very excited to be the big brother and big boy in the house, and showed all signs of readiness. With friends on hand who had had previous success, and her husband home for three days with her, they began. The potty training boot camp started out very positive, but it also soon became incredibly challenging. Ryan would miss the bathroom by seconds, and one day had nearly 20 accidents. Carpets, couches, and even a favorite toy, took a hit, and it became too stressful and discouraging for both child and parents. Jenna said she found the program too rigid for her boy, for whom the boundaries were just “too tight”. She began to make tweaks to the program, choosing vocabulary that worked for Ryan and things that he would better respond to. After about five days (instead of the three in the program), Ryan had made great strides and was successfully potty trained. Jenna says the potty training boot camp she chose had great advice, but you have to make these programs work for your child. She recommends not doing it alone, but have a partner or friend home with you too. Tag teaming becomes very helpful. Further, she felt age definitely made a difference for her son. Although at age two Ryan could sign “potty” and showed some signs of readiness, it seems it was the extra year of maturity that made potty training a success for him at age three. IT DID NOT WORK FOR US! Misty is mom to Hobie, now age three. Misty has tried the boot camp type approach twice. The first was when Hobie was about age two and a half. While Hobie was going naked from the waist down, and could understand the concept of going potty, the boot camp method was a huge struggle for him. Misty could tell he just wasn’t ready and did not continue past Day 2. The second time she tried the method he was just over age three. At this point Hobie would sit on the potty, but he had very frequent accidents. This time Misty tried for a full week (programs generally promise about three days), and again felt it wasn’t right for him. She returned him to diapers. As you can see from these stories, a potty training method can be a flying success for one kid and an epic crash for another. It truly depends on the family dynamic, readiness of the child, and philosophy of the parent. The good news, as always, is they all eventually get it somehow at some time! So choose the method that you know works best for you, and carry on! How do you get over the almost potty trained hump? (Maria K) First, take stock of where you really are. Is your child overall doing well, but having a few accidents here and there? That’s normal! Ride it out with your regular routine and things should soon be on their way. Maybe there’s been a little glitch, such as a regression where accidents are happening more frequently. If this is the case, try to assess what caused the regression. A change in routine, a new baby, a parent going back to work, anticipation of a big event… these can all lead to some pretty natural regression. Again, stick to your routine, or if need be, you can back up a bit. You might re-visit a reward system (such as our free downloadable chart) or go back to more frequent reminders, including something like the Potty Watch or a timer. Also, try to address the area of regression by offering some extra reassurance and attention around whatever is troubling. Sometimes there is no real tangible reason for regression, and that’s okay too. Again: routine-routine-routine! Pretty soon that “almost potty trained hump” will be a thing of the past. Undies or not during the first few weeks of potty training? (Sabine S-D): I think this is ultimately a pretty personal decision. There are some parents who really like pull-ups or need the reassurance of dry pants during a busy day. However, I also have many parents tell me that pull-ups just replaced diapers and weren’t a great help. Personally, I ditched all things absorbent and went for the undies. However, I kept a pack of pull-ups handy for things like long car trips (just in case! ), and they did come in handy from time to time. What about early potty training when they don’t talk much yet? (Jennifer B. ): This is where our Potty Time program is very unique! Because we encourage signing while potty training, the actual words don’t even have to be there yet! Just consistently use the signs from our program (also available in free downloadable flashcards) POTTY, WIPE, FLUSH, WASH (you can throw in ACCIDENT too), and if your child is otherwise ready for potty training, the signs can easily be used instead of the words. Oh… and don’t forget to CELEBRATE!